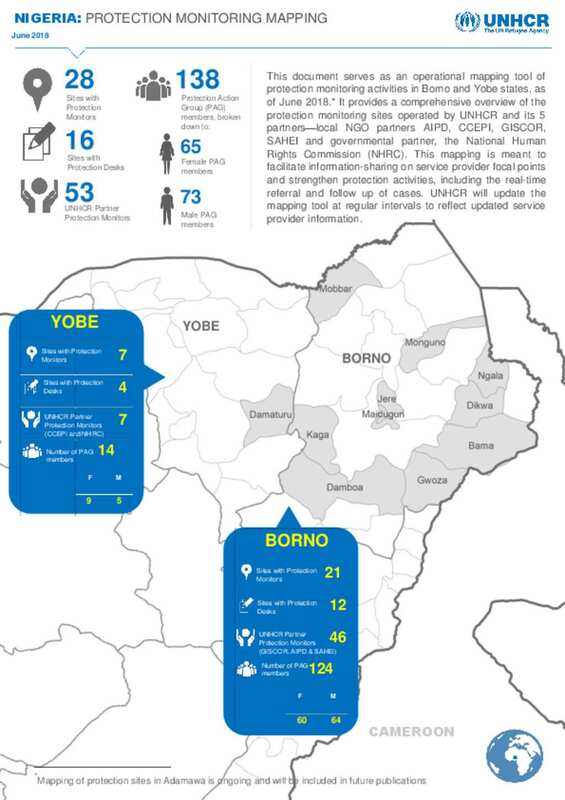 This document serves as an operational mapping tool of protection monitoring activities in Borno and Yobe states, as of June 2018. * It provides a comprehensive overview of the protection monitoring sites operated by UNHCR and its 5 partners—local NGO partners AIPD, CCEPI, GISCOR, SAHEI and governmental partner, the National Human Rights Commission (NHRC). This mapping is meant to facilitate information-sharing on service provider focal points and strengthen protection activities, including the real-time referral and follow up of cases. UNHCR will update the mapping tool at regular intervals to reflect updated service provider information.